Our home was built as an artists place, where each of us may pursue his or her peculiar talent. When first envisioned, Grandma was needing to be diverted and her special needs were addressed, making our facility particularly well suited for the handicapped, sporting special steps throughout the grounds designed for wheeled chairs, and an elevator between floors at the main house. The first terraces were created around the Wheel Chair Steps. The shortest dimension of each step is long or wide enough to park the wheeled chair on any one of them. The gardens in the center of the stairs and ramp were the first ones we made. The telephone poles were surplussed by the electric company, costing only alot of elbow grease. Mom excavated 18 inches down for each one. Dutch iris and hostas given as starts from the neighbors combined with other iris we did buy complete the beds. The llamas supply the fertiliser each year. 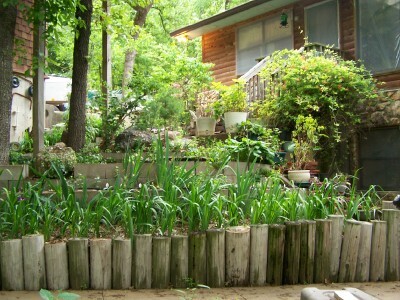 These beds were the next project, as we attempted to slow down the erosion of the front yard and save the house from inundation. 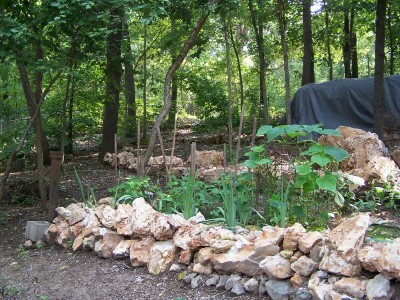 Mom designed retaining walls all over the place, but the lions portion of the erosion control was with very simple means, involving rocks and concrete block. The soil is kept in place with day lilies gathered from the grounds of a demolished house nearby and the descendents of the iris Grandma brought and planted here on our lots before the move to Texas in 1965. 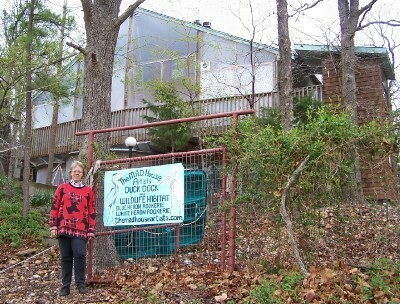 Here is Mom with the newly erected Duck Dock sign. Behind Mom is the block terrace that keeps the back concrete deck from falling into the lake. Crocuses, Jonquils, Tulips and Narcissus along with more day lilies and iris to hold the soil. 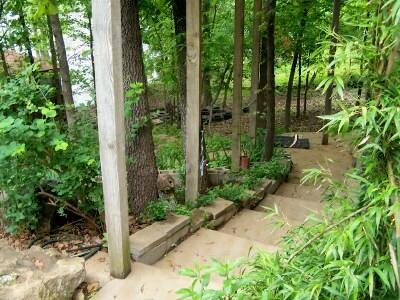 The concrete block steps were placed by Grandma in 1970 before any of the house was built upon the foundation (1996). Through a lucky fluke we inherited the large rock refuse excavated by the water and electric company a few years ago, which really helped us in our rock-gathering exercises. 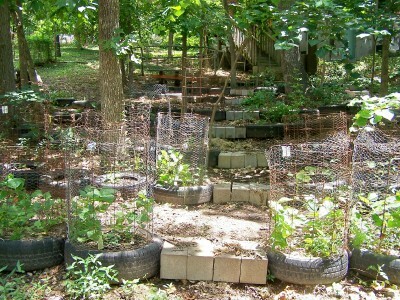 This is a vegitable garden with green beans and cucumbers from 2008. These terraces are just placed rocks, with gradually built-up soil of llama and leaves. every year we have carried more of the llama fertiliser to cover the leaves, and we have such rich soils that now in 2009 we are getting a good crop of green beans and cucumbers even in the partially shaded garden(above). 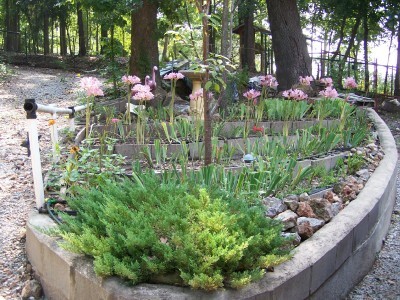 Mom is very pleased that the sedums given by the neighbors have finally overcome the chickens and set into the garden! In 2005 and 2006 Dad and Mom set in these steps to carry one to the five-sided playhouse built for Mink's many toys and friends. The real challenge was to terrace this huge vale without spending any money. This carries the runoff for the whole hill and the road in front of our place, and was washing out anything we had tried: concrete block terraces, bales of hay, all washed away into the gates at the bottom of the hill. Dad read in his copy of Martha Stewart Living about railroad ties and beautiful grasses, but railroad ties cost money. Then Mom had an idea. Mom has excavated and carefully LEVELED shaped places for each tire, set each tire into its place, and Mom and Dad have filled each tire with rocks, dirt, yard mulch and llama droppings. The leveling of the tire is critical in its stability, and the weight of the rocks keep the tires in place a they are getting set-in. By August 2009, over fifty-five tires had been placed, with three terraces yet to build. 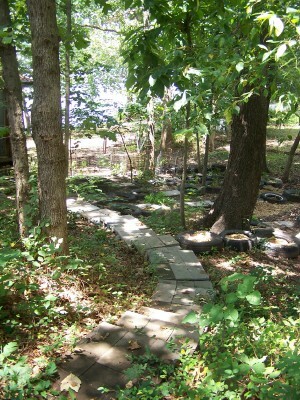 Access to the gardens had been accomplished with concrete block steps between each level. 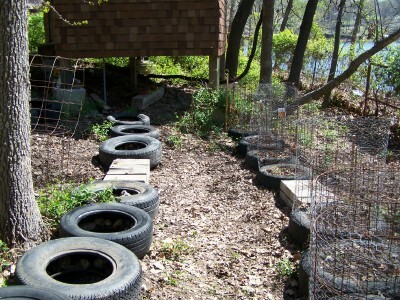 The green beans, phlox, redbud trees, tomatoes, snow peas, basil, and hostas were all planted in the tires and flourishing. The plants in the tires will hold the soil, and the rocks and soil have helped anchor the tires and eliminate the chance of mosquitos. By 2011 the terraces were complete,and we were beginning to see the results. With Free-ranged chickens, there is always a little competition between the enthusiastic chickens and the "tendre croppes", as Chaucer so eloquently put i. Many wire cages have been added to the mix to allow the plants to get set-in themselves. 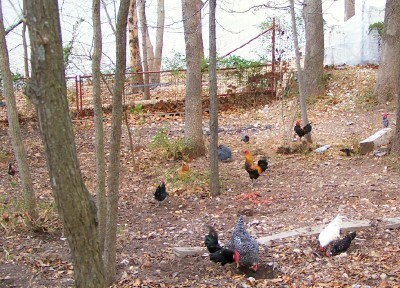 These have no effect on the runoff or the erosion control, just the chickens versus the plants. By 2012 the Tire Terrace had not moved an inch. 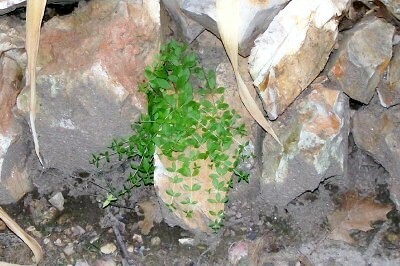 Erosion on the watershed has stopped entirely. Soils on the various terraces are leveling behind the rows of tires, forming rich areas for planting ground cover. Waterfalls on the concrete blocks have dug depressions under each step, which we will solve by making the pathway completely of paving stones or adding more gravel in the path. 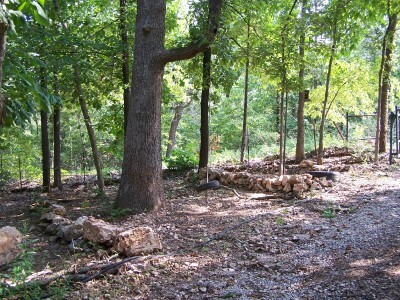 When we removed the few leaves that had collected against the gate at the bottom of the hill in March of 2012, there was no accumulation of soil. The row of concrete blocks we had laid along the bottom inside the gate was not covered, and the holes were still exposed. Less than an inch of soil against the blocks! Who would have thunk it? What a wonderful success story! Please share this with your neighbors and Corps of Engineer friends!